The intense politicking that went into the election of Yakubu Dogara as the speaker of the house of representatives in 2015 has been detailed in his biography by Ovation publisher, Dele Momodu. In the book, ‘A Reed Made Flint’, Dogara narrates how he came against all odds to win the nation’s No. 4 position, including surmounting a fierce opposition from Bola Tinubu, a national leader of the All Progressives Congress (APC), who wanted Femi Gbajabiamila on the seat. The book is due for public presentation on December 26, 2017 to mark the 50th birthday of the speaker. Gbajabiamila had been endorsed by APC for the speakership but Dogara, who defected from the Peoples Democratic Party (PDP) in 2014, decided to give it a shot. Dogara recounted: “As a matter of fact, Asiwaju (Tinubu) is someone that we respect very much and no one can doubt the sterling role he played in the emergence of APC as a government. Asiwaju had through emissaries sought audience with me and in deference to him I went to see him along with a colleague, then Right Honourable Kawu Sumaila. When we got to the Asiwaju, seasoned politician that he was, he asked us to come to his bedroom. We held this meeting in his bedroom! 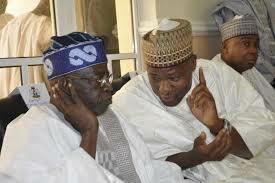 While Dogara did not say an outright no, he also did not give a definite yes to Tinubu’s request. He said: “This has always been my stand, Sir. It was my stand when (Aminu) Tambuwal was running for the Speakership and I ran for the position for Deputy Speaker. Even when my bosom friends had told me clearly what was happening and I knew, as an experienced politician, that we were running into head winds. I had seen clearly the implication that Tambuwal was favoured more than 80% to clinch the Speakership. But I insisted that I was going to run because the party had said they had zoned this position to the North-East and I wanted to make a statement that there were people from the North-East willing to contend for this position in the interest of our own people. Dogara was quite vehement, insisting that in the interest of his people, it was necessary for someone from the north-east to run for that position even if he would lose. He told Tinubu: “Since you have appealed to me as a father figure and I see you as a political father and as a mentor, a person we always ran to for advice really in the seventh assembly, and I still remember so many occasions I had to come here to seek assistance on behalf of others from you, I owe you the responsibility to listen to your appeal. Dogara, who represents Bogoro/ Tafawa Balewa federal constituency in Bauchi state, went on to defeat Gbajabiamila, who represents Surulere federal constituency, Lagos state, by 182 votes to 174 in a fierce contest. He later made Gbajabiamila house leader.